We’re having an odd warm up in our area, totally perfect for hot grilling. Plus we bought a new grill and I am in love. We had our other grill for eight years and it did so well with three moves, rain, snow, and it wasn’t top of the line, so good job grill, you did us well! And now we move onto our new grill, we got a smaller one, but it is super efficient even heating, super good quality, perfect for us grill. And I could not be happier with it. We procrastinated for a bit on buying a new grill that we were cooking in the back left corner where there was even heat lol!!!! Now, no need, we can use the ENTIRE GRILL. Clearly that makes me super happy, so every recipe I make is now grilled, ok just kidding. But we are outside a lot grilling, even when we had the old one. We love cooking over the open flame, it makes food so good. But now with this new one, it is much easier. And that brings us to easy pork tenderloin. We really need to eat this more often. It’s crazy how fast it cooks, it’s leaner than red meat, and marinates beautifully, soaking up all of the flavors of whatever you put in the marinade. Which I love! So for example, this recipe calls for marinating for 1 hour. But you could totally put it in the marinated the night before, go to work, come home, and cook dinner in 15 minutes. YES. I made this herby concoction for the marinade and it’s a keeper. I served with a whole grain salad and grilled broccolini, bam. Dinner. Healthy and so tasty. Add olive oil, red wine vinegar, parsley, garlic, and brown mustard to a large zip lock bag, seal and shake to combine. Add pork tenderloin, close tightly, and massage marinade into pork until well coated. Place in fridge to marinate for 1 hour minimum, and up to 24 hours. Heat grill to medium high. While grill is heating up, remove pork from fridge. Place pork directly over heat, season with salt. Cover and cook for a total of 12-15 minutes. Turning every minutes and until the internal temperature reaches 145 degrees. Remove from grill, place on cutting board, and wrap a foil tent over meat to keep warm. Allow to rest for 10 minutes before slicing and serving. Slice into 1/2 inch thick pieces. Store leftovers in an airtight container for up to 3 days. 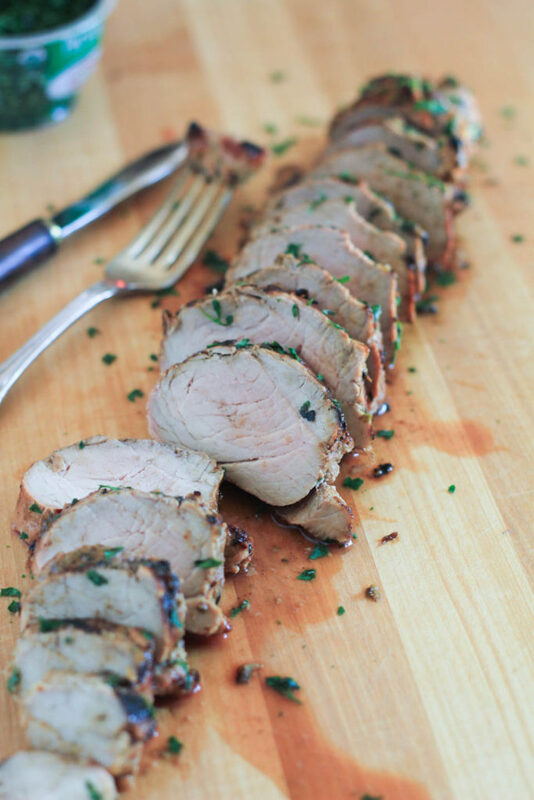 Pork tenderloin is so versatile and I just don’t think to cook it often enough. And you can’t beat the Gourmet Garden herbs. Love the look of this recipe! We’ve been grilling a ton too lately, just minus the new grill thing :(…ours is ancient and has made the move with us a few too many times, but hey, it’s still working! Love this simple marinade for an easy dinner option! Seriously, ours was soooo old but totally worked! Until one day, it didn’t lol. It even had spots where the metal was gone, we grill a lot, clearly! Thank you! 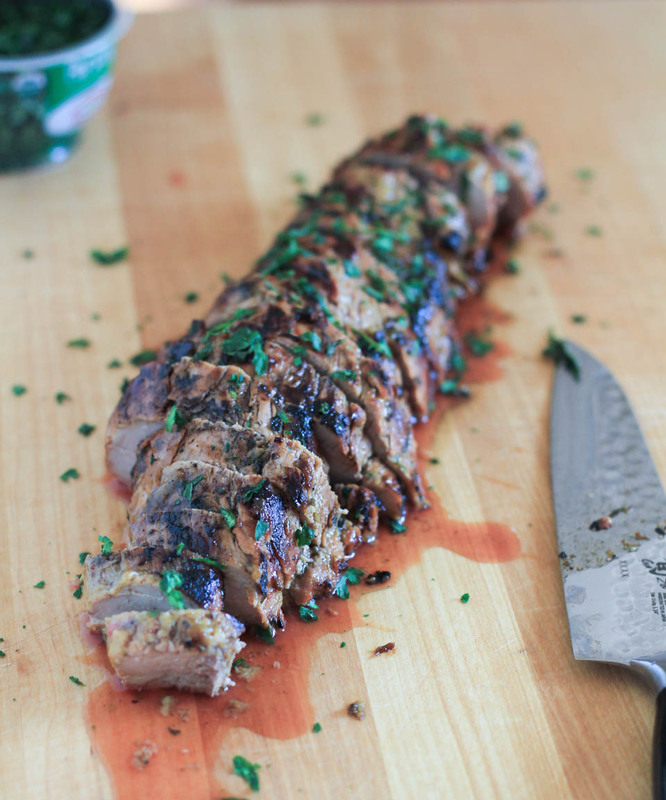 A great grilled pork tenderloin just cannot be beat. This looks wonderful! Love how easy this is, which is perfect since the kids are back to school this week! Can’t beat easy and good right?!! Thank you!